Want to ask a nutrition question? Fill out the form on this page. Make sure fueling during training and racing is easy! Fuel Belt in YT Colors! Worried about fueling for your next race? Make a plan! Products like Fuelbelt range from race belts that hold your bib number around your waist to mini squirt bottles that you can use while running, which help a ton with hydration. 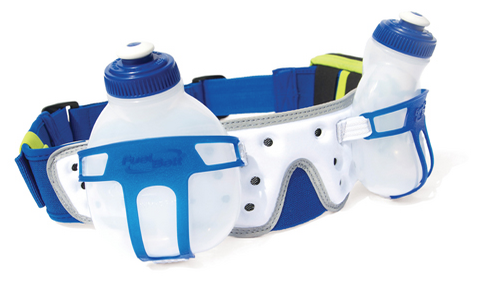 My favorite product is the Revenge R20 Hydration Belt (as seen in picture). Each squirt bottle holds 7oz. of liquid. I like to put a sports drink in one bottle and water in the other. It’s nice being able to stay hydrated on runs without having to hold anything! Besides around the waist hydration products, bottles that fit into the aerobars of your bike are a great option for easier fueling!